My 3rd grader read this to me and her little (1st-grade) sister, and we all thoroughly enjoyed it. Clementine (also a 3rd grader) is such a funny, creative free-thinker. However, she's having a pretty tough day as the book opens. She is has been sent to the principal's office after a hair cutting "incident" with her friend, which is not entirely Clementine's fault (although her own good intentions were definitely involved). When Clementine says, in the third paragraph of the book, "Someone should tell you not to answer the phone in the principal's office, if that's a rule," I knew I was going to like the book. Clementine's life has its ups and downs. She terribly misses her cat, Polka Dottie, who died before the book begins. Her relationship with her friend Margaret runs hot and cold, as friendships occasionally do. Clementine resents being named "after a fruit" and refuses to call her little brother anything but vegetable names, from Asparagus to Zucchini. Clementine sometimes wishes her bedroom looked like a bedroom in a magazine, like her friend Margaret's (although she's not allowed to touch anything in there) and that her artist mother were more like other people's mother's, instead of working in the living room in paint-splattered overalls. When she mentions this, and she and her mother try to picture how her mother would look going to work, dressed like Margaret's mother (who works in a bank), they both burst out laughing, and suddenly things seem pretty good just the way they are. 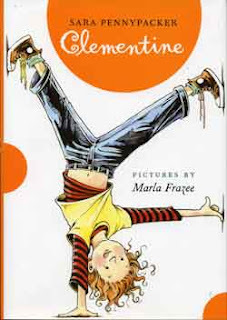 It is hard to talk about Clementine without comparing her to Ramona and Junie B. Jones, two characters who are definitely her soul sisters. But she certainly stands on her own as a character in her own right. There is a depth to the characterization and themes of Clementine that makes this perfect for children who are ready to move on from Junie B. but sad to leave her behind. Clementine is irrepressible, good-hearted, trouble-prone and very entertaining! We are all looking forward to reading the sequel, The Talented Clementine. There's a sequel? I adored Clemintine when I read it to my kiddos. Even my teenager liked it. Very cute! Yes! I actually discovered Clementine when I read a review of the sequel. It mentioned the first one in such glowing terms that when I saw it at the end-of-school 1/2-price book fair (my favorite!) I had to pick up a copy.